Beautify your bedroom with this elegant and attractive pillow shame. This decorative piece is made with a cotton-polyester blend and is machine washable. Available in either a standard or king sham, you can choose from five different color options to make sure you can easily match with your existing decor. The shams are nice fabric. Not comfortable for sleeping, I'm sure, but I don't think shams are intended for sleeping. They do not have zippers, they are more envelope style in design. I found the standard to be a snug fit for my pillows, but I think a pillow in a sham should be full in appearance. I didn't want the shams to be much larger than the pillows. While I was wrestling in one of the pillows, however, I heard some stitches give. I don't see any unraveling and it wouldn't be that big of a deal to put in a few stitches if necessary. I don't see any damage, but I've been a bit more gentle with the shams ever since. I have found it difficult to find reasonably priced, plain solid color shams. These shams fit the bill well. The somewhat rough fabric goes well with a patchwork quilt. 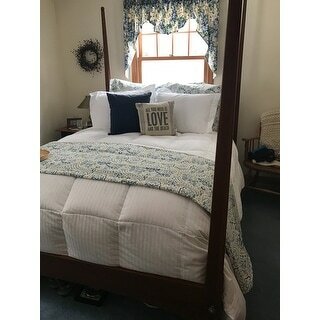 I doubt it would work well in a more formal bedroom-- it is a better match for a country style quilt than it would be for a more elaborate bedspread. I was looking for pillow shams for my guest room, and didn't want to spend an arm and a leg. I hunted high and low before finding these on Overstock. These were inexpensive, yet looked as though they were substantive; simple but attractive. I was not disappointed. The fabric was every bit as thick as I had hoped, and the color was a dead-on match to what it looked like online. They look great with the quilt on the bed. They washed up nicely -- not wrinkled -- went right on the bed and looked great. I love the color and texture of the Cotton Blend Poplin Tailored Decorative Pillow Shams (pack of 2) in King Mocha AND the 2) Fresh Ideas Poplin 14" drop bedskirt in King Mocha. The fabric texture and color of the bedskirt and shams are identical, therefore match perfectly. 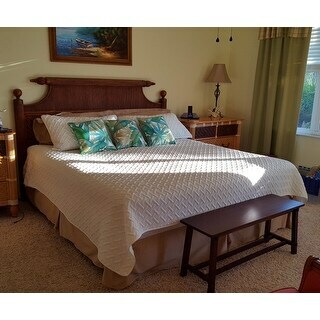 I paired these with another Overstock purchase: the VCNY Nina Embossed 3-piece KING quilt set for my king bed. I bought white (the quilt fabric feels like fine brushed no-iron cotton and washed flawlessly). I have slept on these shams and they're pretty rough at first but get more comfortable as you break them in. However, the main problem that I have with them is that they slightly tore at the seams when I was putting them on a pillow. I'm not at all impressed with the quality. Also, I ordered them in Ebony and the color was rather ashy looking. If I were you, I'd buy something else. First, the shipping was fast and they are just plain ivory colored pillow shams (which are harder to find than you would think) but the price DOES reflect the quality. They are not 100% cotton and because of the cotton/poly blend, they felt pretty rough but it's exactly what you would expect with a blend. If they are strictly for decor pillows that you throw on and off your bed and their primary purpose seems to be inducing complaints from your husband as to why you need pillows that you don't actually use...well then, you are good to go. However, if you are looking for high-end thread counts and super soft tactility rewards then you'll have to shell out some more jack. Very good quality. Loved the poplin/cotton blend. These tailored pillow shams are well made of sturdy yet nice-feeling fabric. They fit my pillows just right and the color matches the existing comforter I owned. I am delighted with this purchase. Often the color samples on the computer and the actual product color are slightly different. Not so in this case. The color was exactly as I imagined and co-ordinated perfectly with the quilt I already had! Love my new shams. The color is a perfect match for my bedroom, and they give a great touch to my room. I got some white ones also, and I swap them back and forth to go with my navy and my white sheets that I purchased from Overstock. I also bought a white sheet with a mostly navy print from Overstock, and my bedspread is white. This combo gives me many ways to decorate with our spending too much money. I like the weight of the fabric and the color is very dark navy, just what I wanted. My old bedding of five years had finally given out. So to get us by until I was able to find the bedding I wanted I changed everything to white. I think the shams are great and fit my current needs. I would recommend this product to my friends. I was shocked at how scratchy these shams were. They seem to be very durable, but don't belong on a bed. Just not soft enough to go with my 500tc bedding. These are going back. Good overall but fits very snug. For what I need it, it does the job. I ordered the duvet several weeks ago and it came with two shams- but I wanted a contrasting color for the other two pillows- I ordered the sage green and it finishes off my bedding set beautifuly. Very happy camper! I love these shams. The are crisp to the touch. They fit perfectly and were a good value. These are well made,however the fabric is not very soft and they are sized more like a euro sham instead of regular standard. For the price they're ok.
Well made and just as advertised. Pleased with purchase! These worked perfectly on our king size bed. They came out of the packaging without significant wrinkles, which was nice. Yes, thin but doesn't fade. It is magnetic of fabric so you'll use a lent roller a lot. Simple comfortable; they do exactly what they were meant to do. Haven't washed them yet so we'll see about that, but so far I'm very pleased. Love these shams!! They are reasonably priced and look awesome on my bed. 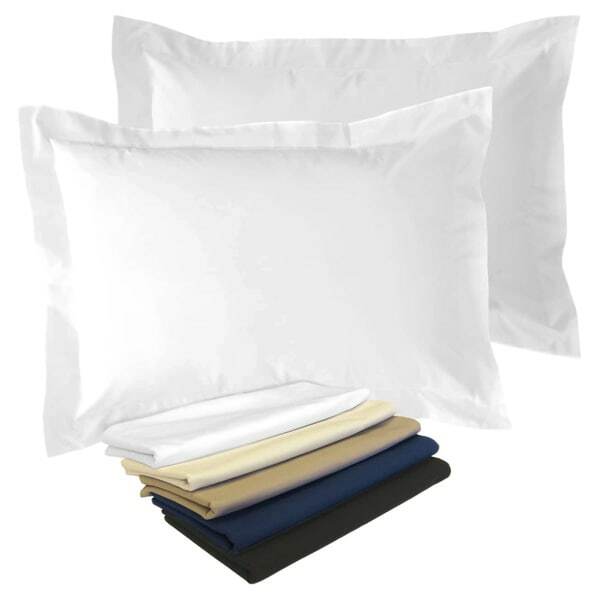 I would recommend to anyone looking for pillow shams. These shams matched my sons comforter and made his bed look complete. I would definitely recommend this brand of sham to friends. "Do the shams come in a queen, or is a standard same as queen?" I used standard on my queen bed. You only have 2 choices, standard and king. So I would imagine standard would fit the bill in place of queen. Notice the dimensions they have listed in the details section. The standard size fits a 20in. by 26 in. The king is 20in. by 36 in. Measure your pillows and go from there. "Is there any sort of satiny or sheen to these shams? Or pretty matte?" There is no sheen. They are matte. Yes, I had that same question before I bought them. It's hard to say, it's not completely matte, but not shinny either. But if I had to pick one, I guess I'd say matted . They do the job and look nice. They would work with pretty much any material you want to compliment them with. Good Luck! "What is the ratio of Cotton to Poly? Exactly how HIGH is the actual COTTON CONTENT? ?This isle very important to me, as I'm allergic to ALL synthetics and must use the most natural blends available, Rare, My personal favorite is Cotton/Silk. It seems I'll have to begin to manufacturing my own. As they're rarely available, especially in bed linens. Thank you for your honest answers." I've owned these for about a year. I don't know the EXACT ratio cotton/synthetic. I know fabric, and I'm going to say it's a very high content of cotton. This is a sturdy fabric which feels 100% cotton. The shams are durable, and stand up nicely. I'd say you'd be fine with these. Found them to be coarse, stiff, and scratchy. Use them only as decorative covering for extra pillows. I prefer linen, linen-cotton blends, or cotton-silk blends. They all have wonderful "hands" and are luxurious for sleeping. Live in desert climate myself, and poly-anything is awful! Worth spending a little extra $$$ for a good night's sleep! I needed king size shams in this color. "Are the bottom corners of the bedskirt split to fit around bed frame legs?" "Will will Overstock.com have the sage standard shams available?" Items are restocked as they become available, however we cannot guarantee an item will be restocked. Please feel free to check back with us periodically to see if the item has returned. "where were these shams made--USA, China?" These were made in China.